The ancient Samurai of Japan realized the importance of being in the very best physical condition. Though they may not have heard of “aerobics,” they knew in order to win and survive the long battles took enormous endurance. They understood the concept of specificity of training. They would practice their sword cutting and thrusting techniques thousands of times every day to build their strength, power and endurance. 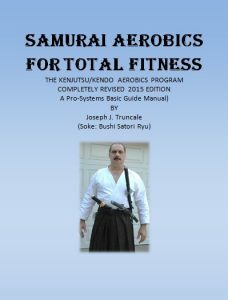 The great thing about Samurai Aerobics is that students can also learn the basic principles of Kenjutsu using the Bokken (wooden sword) as they get into fantastic physical shape.